Balloons in the Battle Dojo. Balloons are destroyable items that appear in Splatoon's tutorial, various Octo Valley missions, Octo Canyon missions, and the Battle Dojo. They also appeared in the tutorial of the E3 Demo. Balloons come in a variety of colors, tied to a weighted string that keeps them suspended in mid-air. In the Battle Dojo, balloons are decorated with the Battle Dojo logo. Balloons in the tutorial and the E3 Demo's tutorial have the Turf War logo, and balloons in Octo Valley have the Octo Valley logo. Balloons act as targets for testing weapons and the game's controls, as they can be popped by shooting at them with ink. In the Battle Dojo, popping a balloon awards one point normally and two points during the last minute of the battle. In Octo Valley, balloons often contain Power Eggs, which are automatically collected when they are popped. In Octo Canyon, balloons are also found in sectors, both that will grant players Power Eggs and even a Sunken Scroll. When the first colored balloon is popped, an arrow will tell the player where the next set of balloons are. The player then has to follow the balloons and pop them in the amount of time, otherwise, the balloons will float away and the player has to pop the balloons in the back from the beginning. Once the player has popped the last set of balloons, a Scroll will appear from inside the balloon. 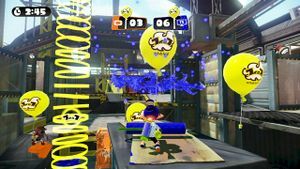 In the Octo Expansion, the balloons' appearances have been changed to resemble foil balloons instead of rubber ones and have a target on them. A new type of balloon known as a "Fail Balloon" which if Agent 8 pops it, they instantly lose a life. This page was last edited on 12 April 2019, at 17:05.